I was just commenting that Llig’s offering didn’t look too threatening when there was an ominous explosion and my computer screen died instantly – a real black screen of death – and I hadn’t even printed the grid! We live quite a way from the nearest place that sells replacements and it was dark and raining, so the Listener must be important to us, as, about ninety minutes later, with a new screen in place, we were underway. 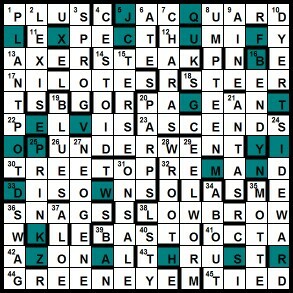 What a relief, then, to find that this was not the dreaded crossword where ‘all the letters are misprints to be converted alphanumerically to a code that will give a Greek proverb and then encrypted via a Playfair square to give a popular nursery rhyme … etc.’ In fact, the difficulty of the device meant that the clues had to be fair and relatively straightforward, and, within an hour, we had an almost full grid. With such an eventful start, I hadn’t even skimmed through the clues to confirm Llig’s membership of the Listener Tipplers Enclave but, on checking now, I find some entertaining surface readings like the ‘not very intellectual’ person making ‘animal noises at gallery’ and some ‘outwardly obese’ person ‘pursuing virtually every purgative treatment’ … and not a trace of alcohol. Oh dear! We had found a few of the pairs of extra letters before I read the preamble carefully and noticed that word ‘unchecked’. That made things so much easier. We were looking at only the clues that had two or more unchecked letters and our thirteen anomalies had to be among those. By this time, when we found an X in EXPECT or EXPERT, a Z in AZONAL and a probable J and Q in JACQUARD, it was a bit like playing Scrabble. Clearly, those thirteen pairs were going to add up to the 26 of the alphabet and each would appear only once. Lovely wordplay that gave us, for example ?END? (last of payload in pursuit of space), ?RIN? (fashionable under river) and RE?A?D (one covered in colour), so that we had soon used all our letters except for M,N,P and K, and had only two definitions to explain, ‘Groom’ and ‘put back in can’ – obviously PRINK and REMAND. Just my level of crossword – sufficiently challenging with no desperate grid-staring at the end. But the other Numpty said “In what way do the unchecked letters considered as pairs have alphabetical significnce?” That gave us a lovely little penny drop moment at the end, when we realized that, if we worked outwards from the MN in the centre of our alphabet line, the letters paired off, with Y partnering B and Z finally marching off with A in AZONAL. Now that was clever and must have taken lots of thought (and, of course, that makes sense of the title: S partners H, R partners I, and V and E go off together – could have called it LOVE couldn’t she/he?). Many thanks, Llig. This entry was posted on 5 December 2014 at 4:00 pm	and is filed under Solving Blogs. Tagged: Llig, Shrive. You can follow any responses to this entry through the RSS 2.0 feed. You can leave a response, or trackback from your own site.